In the Swaminarayan Sampraday, DHARMAKUL refers to the divine lineage (GURU PARAMPARA) starting from Bhagwan Swaminarayan up to the present & future lineage of Acharyas (GURU). Dharmavanshi means belonging to the lineage of Dharmadev – the father of Bhagwan Swaminarayan. 2. Do authentic Bhakti (not just to reap fruits but to attain salvation as well). 3. Attain the divine abode (AKSHARDHAM) in the service of Bhagwan Swaminarayan. The initiation of all Swaminarayan followers including the Sadhu’s (Saints), by the respective Acharya is what qualifies one to be in the genuine Swaminarayan Sect. “I shall always remain within the Acharyas from the family of My father, Dharmadev.” – Swaminarayan Bhagwan instructed all his followers to consider the Acharyas as God-personified & serve their respective Acharya with total loyalty & humility. By the time Swaminarayan Bhagwan was ready to return to his divine abode (AKSHARDHAM), he had already built six magnificent Shikharbandh (domed) temples. The satsangis (devotees) numbered over half a million & Sadhus, Parshads and Sankhya Yogis numbered in large as well. It was clear that to manage the growing Swaminarayan Sampraday would require a personality of immense powers of administration and persuasion; a task beyond any mortal being as per tenets of the sampraday. Swaminarayan Bhagwan appointed his two adopted sons, Ayodhyaprasadji the son of his elder brother Rampratapji and Raghuvirji the son of his younger brother Ichcharamji, as the spiritual leaders or Acharyas of the Swaminarayan Sampraday, in Vadtal, on VS 1882 (1825 AD) Kartik Sud Prabodhini Ekadashi (ironically on the same day Bhagwan Swaminarayan was given the Acharya-pad by Ramanand Swami). The Acharyas are the sole representatives of Bhagwan Swaminarayan and have the responsibility of managing the entire Swaminarayan movement (Shikshapatri Slokh 3). In establishing the dual Acharyaship in the Swaminarayan Sampraday, Swaminarayan Bhagwan divided the followers geographically into two, for ease of administration. Bhagwan Swaminarayan divided India into two divisions. Bhagwan Swaminarayan handed the Dakshin Desh – Shree LakshmiNarayan Dev Desh to Raghuvirji and Uttar Desh – Shree NarNarayan Dev Desh to Ayodhyaprasadji. The LakshmiNarayan Dev Desh based in Vadtal and the NarNarayan Dev Desh is based in Amdavad. Although known as Shree LakshmiNarayan Dev Gadi & Shree NarNarayan Dev Gadi, both are the Swaminarayan Gadis as they are the only authentic Gadis established by Bhagwan Swaminarayan himself. The Acharyas are householders and their respective wives (Gadiwala) stand as the females’ Guru. As per the provisions of DESH VIBHAG LEKH the Gadi is passed on to the sons from their family, Dharmkul. The Acharyas of the Sampraday are more than mere administrative heads; they are the spiritual leaders and the Guru through whom the path to Moksha (liberation) is opened. Bhagwan Swaminarayan authorized only the Acharyas to install the images of God in His temples and to administer Saamaanya (basic) Diksha for all male satsangis and specific Maha Bhagwati Diksha for Sadhus, to his disciples in their respective jurisdictions. Nobody else is authorized to install idols or initiate Satsangis. Bhagwan Swaminarayan has promised to reside specifically in the images installed by himself and the Acharyas only. These Acharyas are authorized to initiate the male disciples only. Their respective wife, the ‘Gadiwala’, is the initiator of all female Satsangis and Sankhya Yogis in their respective jurisdiction, with the consent of their husband – the Acharya. Despite being householders, both the Acharya & Gadiwala live as per the direction and following tenets of sampraday. All the above mentioned responsibilities have been prescribed in the Shikshapatri, Satsangijeevan and Desh Vibhag no Lekh, & according to these Shastras, no other individual other than the Dharmavanshi Acharyas are permitted to carry out the above duties. In the scripture Purushottam Prakash (Nishkulanand Kavya), the writer Nishkulanand Swami describes the instance when Bhagwan Swaminarayan established the Dharmavanshi Acharyas. The constitution of the Swaminarayan Sampraday is laid out in Desh Vibhag no Lekh which describes in detail the functions of the Acharyas. “… it is my command to all Sadhus, Bhamcharis and all Satsangis, that for the purpose of your kalyaan (emancipation), you must obey and follow the two Acharyas of Dharmavansh, and obey their commands by thought, action and speech. If this is compromised and whoever turns elsewhere (rejecting the Acharyas) will find that they will never find Sukh (happiness) in this world or the worlds beyond and will experience immense distress” (Desh Vibhag no Lekh). Further more, in one of the most authoritative scriptures, the Vachanamrut, Bhagwan Swaminarayan states one of the pre-requisites for attaining Akshardham. “… The devotee who is aashrit of Dharmakul (he who has received initiation from Dharmavanshi Acharya and remains loyal to the Acharya) gets a divine Bhram-state body by God’s wish…” (Vachanamrut, Gadhada Pratham Chapter 1). So it is seen as imperative to be a humble loyal follower of the Dharmavanshi Acharya once receiving the Diksha (guru mantra) in order to be qualified to achieve a Bhram form. The rules of managing the Sampraday are enshrined in a document which Swaminarayan Bhagwan dictated and got written by Shukanand Swami – it is called Desh Vibhag Lekh. It lays out the boundary of demarcation between the two administrative zones. The protocol required between the Acharyas is documented here. The procedures for appointing future Acharyas are also laid down in Desh Vibhag Lekh. 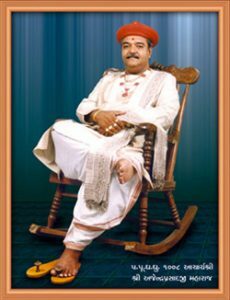 As per the provision of Desh Vibhag Lekh, only the person who is in the lineage of Dharmakul, and has the capacity and quality to follow the principles, philosophy of the sampraday established by Bhagwan Swaminarayan in following, preaching and protecting can become the Acharya. Thus, the eligibility for becoming a Acharya is established and documented by Bhagwan Swaminarayan himself and is accepted by both the Acharyas by endorsing the copies. It is further provided that no one -Acharya, Sadhu, Parshad, Satsangis, Sankhyayogis or anybody-is authorized to make any alteration, correction or eliminitations and any kind of changes in the provisions of these documents in anyway-executing, propogating, illegal publicizing. Thus this Desh Vibhag Lekh is a will of Bhagwan Swaminarayan therefore no one has the authority to alter it or make any kind of changes. In these times of legal challenges upon the Sampraday, Desh Vibhag Lekh has proved to be the basis upon which most judicial rulings are made. Two copies of Desh Vibhag Lekh were prepared and were signed by each Acharya of the respective Gadi in the presence of Bhagwan Swaminarayan and in witnesses of leader saints and grihasthas. The copy signed by Acharya Ayodhyaprasadji was handed over to Acharya Raghuvirji & the copy signed by Acharya Raghuvirji was handed over to Acharya Ayodhyaprasadji.